SAGITA COM - novaPDF Profesional adalah alat untuk membuat file PDF dari file dokumen lainnya. dengan pengaturan yang ada, Anda dapat mengatur resolusi gambar, informasi yang relevan, tingkat kompresi, keamanan, profil, dan banyak lagi. novaPDF Profesional Mendukung dengan file dalam format DOC, XLS, PPT, HTML, EML, TXT dan lain-lain. Creates high-quality searchable from all applications Microsoft Windows PDF-files. Ability to protect the PDF-document password, resistant to cracking. PDF Server can be Share to all computers on the local network. Inclusion of a document in PDF-file. Full support links as domestic. Supports setting watermarks in the document. 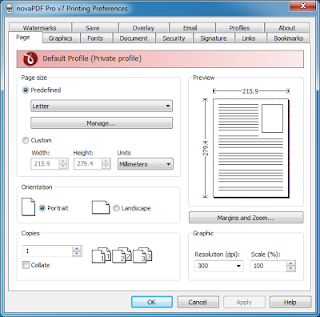 Supports public profilesIt does not require any third-party software to create PDF. Optimizing the size of the file. Embed fonts in a document. High integration in virtually all Windows-based applications that support printing of documents.